Under its lattice dome-shaped roof, Jewel features a range of brilliant attractions. At its heart is the Rain Vortex and surrounding it is the Forest Valley which is a lush garden wonderland that boasts eternal spring. The Shiseido Forest Valley brings the outdoors to the inside with a four-storey garden that houses 2500 trees and 60 000 shrubs from across the world. Marvel at the heart of the Forest Valley as you take in the grandeur of the Rain Vortex. It is the world’s tallest indoor waterfall at 40 metres in height and forms the nucleus of Jewel. By day, the mighty cascade mesmerises as it catches the sunlight. By night, it takes on mystic splendour with a light-and-sound show projected on the sheet on water. Tip: Walk along the Canopy Bridge if you want to see it up close. At the top floor of Jewel is the Canopy Park which will only open in mid-2019. Within it are two gardens to look forward to. The Petal Garden boasts flamboyant seasonal blossoms while the Topiary Walk features photo-friendly animal topiaries. Play in puffs of clouds and hide away in gentle bowls of mist. Kids will love the chance to play in this dreamy setting and let their imagination take flight. Pull on comfortable shoes for a field day weaving your way through Singapore’s largest hedge maze. Get a bird’s eye view of the maze’s intricate windings when you reach the watch tower at its core. Balance your way through an adventure. The Walking Net is suspended across a void, giving you one walk you won’t forget. A taut web 25 metres above ground affords an indescribable sensation of lightness. Hungry tourists and locals have a whopping slew of 112 restaurants, eateries, and cafés to dine at. With all the food you can eat here, we recommend starting with the biggest F&B brands. Look out for international heavyweights, especially those making their debut in Singapore together with Jewel Changi Airport. Pun is intended, but you might derive from its name that Arteastiq Bistro is all about art and tea. They call it the “art of teasing”, but we think there is so much more. We love their refreshing artisanal teas and definitely look forward to enjoying their robust menu of wondrous food dishes here in Jewel. This greatly missed American fast food chain is finally making a comeback after leaving us for over a decade and we hope that it is here to stay. A&W is open round the clock with a menu that is “the first of its kind in Asia”. It features over 25 items, including a Cream Cheese Burger from Okinawa along with their bestselling coney dogs and curly fries. For those who are not familiar with Burger & Lobster, its rustic, yet luxurious concept is fairly straightforward—diners choose among three options on the menu that see the likes of burger, lobster, and lobster roll. Other than the three main dishes, you can also expect new dishes that are inspired by local flavours at the Singapore outpost. Look forward to their opening on 20 May 2019! Hailing from Boston, USA, Emack & Bolio’s is an ice cream parlour that serves up insanely creamy scoops of ice cream. Get your tastebuds ready for a smorgasbord of interesting flavours with whacky names such as Moose Tracks No Sugar Added, Beantown Buzz and Myers Rum Raisin. Herit8ge is the third concept outlet by local player Fresh Fruits Lab—one of our favourite cafes in Singapore. It is draws inspiration from the 70s while paying homage to local flavours, dishing out local favourites with interesting and modern twists. Swiss artisanal Läderach Chocolatier Suisse has landed in Singapore, bringing with them their mountains of FrischSchoggi handcrafted with the best Swiss chocolate couverture and the freshest ingredients to savour. 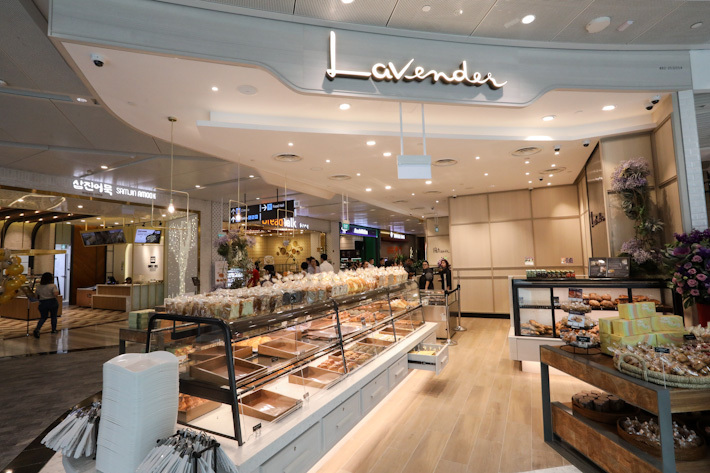 Popular artisanal bakery and patisserie, Lavender, from Johor Bahru has crossed over the causeway and set up shop on our sunny little island. They will only have a bakery here for the time being though. Norwegian casual seafood restaurant, PINK FISH, is a salmon-centric restaurant that only uses fresh Norwegian salmon. This first ever outlet outside of Norway has a variety of salmon dishes in the form of burgers, wraps, hot pots and salads for you to look forward to. Perennial local favourite Rich & Good Cake Shop has now finally opened their second outlet. 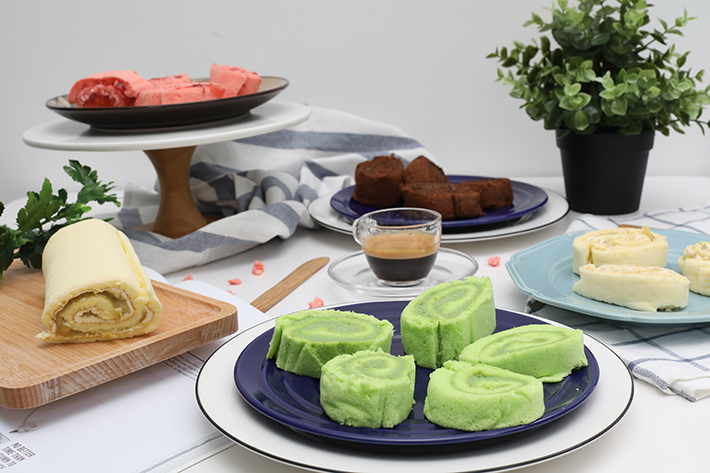 Their claim to fame have been their Kaya Swiss roll and Durian Swiss roll since they started operations in 1997. 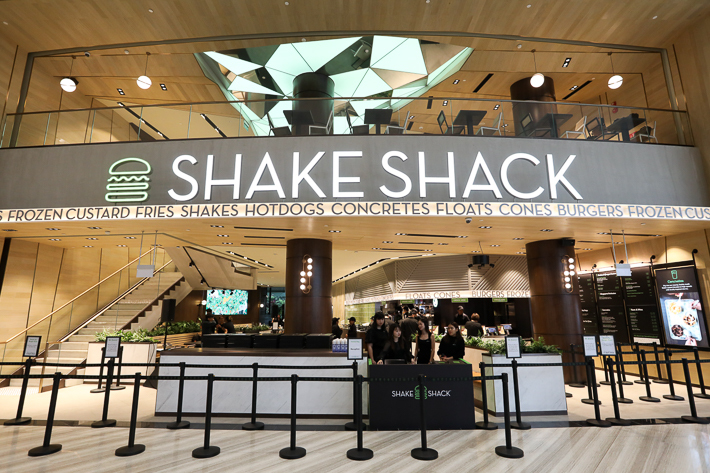 Shake Shack has its humble beginnings as a hot dog stand in Madison Square Park but it is now one of the most well-known fast food chains in the world with 136 locations internationally. 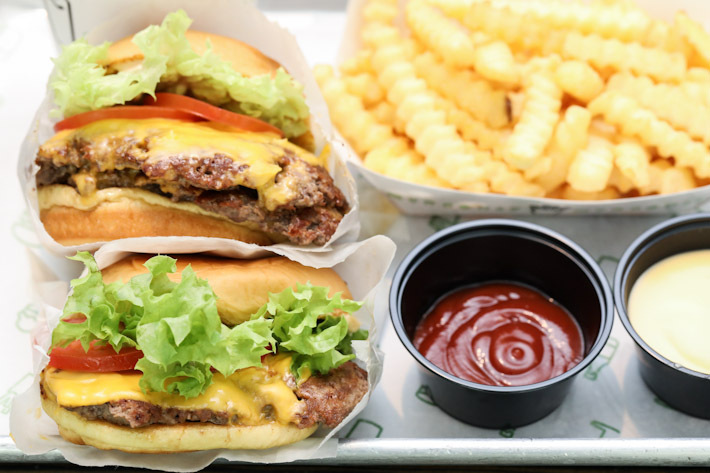 Their debut outlet in Singapore features the same menu as Shake Shack in the US and South Korea. It is needless to say that at every airport, there has to be a coffee shop. 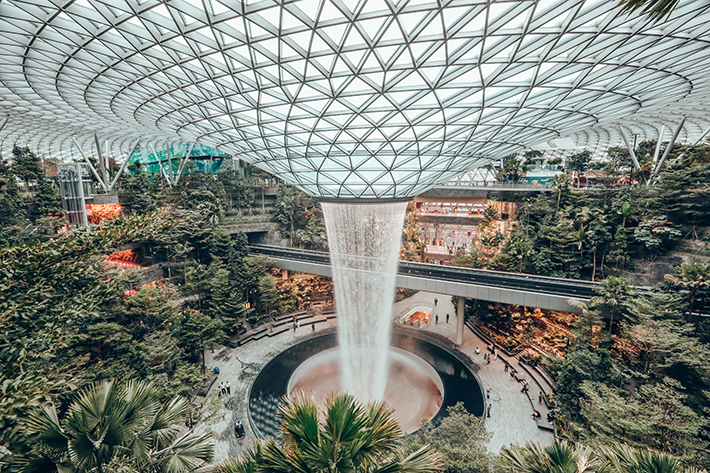 With the opening of Jewel Changi Airport, Starbucks Singapore has also unveiled the newest Reserve flagship store there and here’s what to expect. Sip on some local beer whilst touring Jewel with homegrown beer brand, Tiger Beer. Their Tiger Street Lab concept here is a first-in-the-world, featuring both F&B and retail elements. Expect exclusive-to-Jewel seasonal brews along with some of Singapore’s quintessential street foods. Besides the myriad of dining destinations, savvy shoppers can get more than enough retail therapy at the ‘World’s Marketplace’. Make a beeline for international marques to local labels for the unusual, the novel, and the popular. Sportswear fanatics can lose themselves in Nike with its 1000 square meter store, which is Nike’s largest outlet in Southeast Asia and India. The world’s only Pokémon Centre outside of Japan is in Jewel Changi Airport so you can go crazy with merchandise such as seasonal and regional exclusive toys, stationery, trading cards, jewellery and even chopsticks. Exclusive to Singapore are Pikachu plushies in pilot and cabin crew uniforms!